Partners for a Healthy Baby is a nationally recognized, research-based, practice-informed curriculum used by many home visiting models to improve birth outcomes, reduce rates of child abuse, increase intervals between pregnancies, strengthen families, enhance child health and developmental outcomes, and support family stability and economic self-sufficiency. The Partners curriculum was developed by a highly experienced multi-disciplinary faculty team at Florida State University and designed to support a systematic approach to planning and conducting effective home visits. The FSU Partners curriculum is unique in that it addresses issues of child health and development within the context of the multifaceted needs of expectant and parenting families. The evidence-informed content in each book supports the home visitor's ability to systematically plan home visits and address key topics that are essential in achieving both family and program outcomes. Each book in the four-volume curriculum series has a Research Basis, a User's Guide, an Overview of Topics, and an accompanying set of full-color Parent Handouts for the home visitor to use when planning their visits. 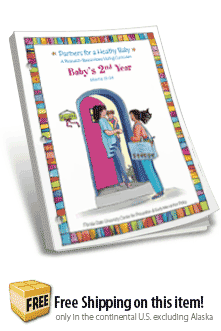 These Parent Handouts, which can be purchased separately, summarize critical information and help the home visitor introduce subjects that may otherwise be difficult to talk about with families. A set of tear-off handouts to accompany the curriculum: Baby's 2nd Year.